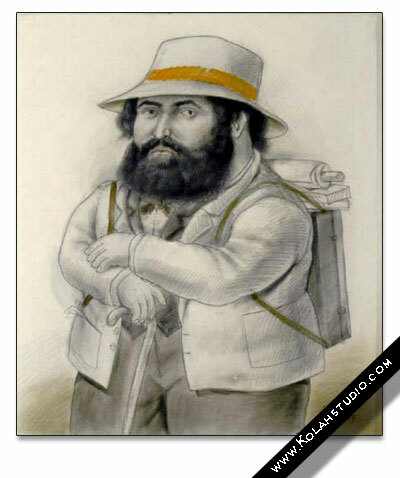 Fernando Botero, one of the most celebrated living artists in Latin America , has gained international fame and fortune capturing the whimsy of life by painting his fellow Colombians, aristocrats and workers alike, as corpulent and comical. “If they make an impression on the public, I have completed the mission of showing the absurdity of the violence,” Mr. Botero said in an interview.The exhibition, dryly titled “Botero in the National Museum of Colombia: The 2004 Donation,” officially opens on Tuesday and after two months here begins a tour of at least four other Colombian cities, including Mr. Botero’s native Medellín. Speaking as museum workers put the finishing touches on his exhibition on Thursday, Mr. Botero said he had given the museum permission to lend the collection to other museums, including institutions outside Colombia , opening the possibility that the works could travel to the United States . In many countries plagued by conflict, years can go by before artists tackle the difficult, painful subject matter. But Colombia, where rebels first took up arms in 1964, has had a long, storied tradition of accomplished artists like Alejandro Obregón, Doris Salcedo and Débora Arango painting about the horrors of the relentless violence that has taken at least 200,000 lives.Mr. 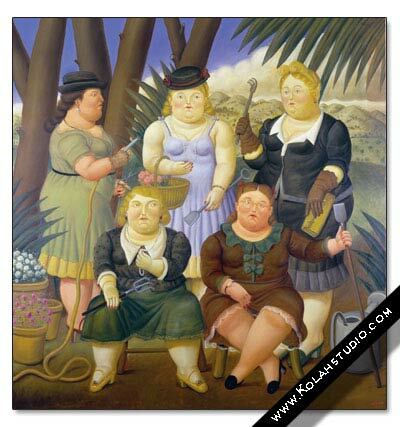 Botero, however, had conspicuously avoided addressing the conflict. Painting and sculpturing prolifically since the 1950’s, he instead recreated life in villages and alleyways, living rooms and bathrooms. Except for his earliest works, his style since the 1950’s has varied slightly, his subjects always voluminous, as he prefers to put it.He has painted wealthy families in their Sunday best. He sketched nudes drying their hair, as well as extravagantly large oranges and bananas. He painted a s leeping president, still wearing the presidential sash, generals in elaborate uniforms and the dour mother superior of a convent. 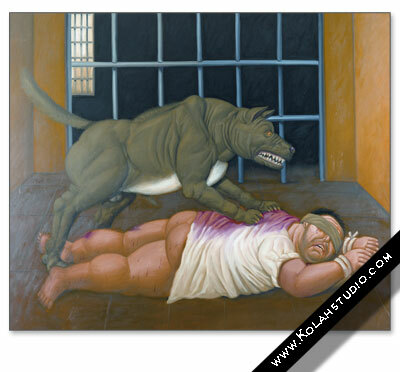 Still, Mr. Botero said that the images he has painted were not always true to life but represented his vision of what happened.In “Massacre in the Cathedral,” a 2002 oil, he tackled a representation of the errant rebel rocket attack that killed about 120 people, including more than 40 children, huddled inside a church in May 2002. After the attack, Mr. Botero explained, he heard a s hort radio report on it while driving in France . He imagined the destruction in a cathedral in Colombia’s colonial crown jewel, Cartagena.The painting he created in one week shows pillars overturned, an elaborate altar off kilter and the rotund bodies of Colombians, all appearing to be descendants of Europeans, buried under rubble.In reality the church was a tiny, hardscrabble chapel in Bellavista, an isolated, dirt-poor village in the jungle, its occupants all Afro-Colombians. Mr. Botero said that he was creating more works about the war, and had finished another two or three paintings and 10 drawings.”I have no intention of earning money exploiting Colombia ‘s drama,” he said. “These works are not for sale. They will always be donated.”Mr. 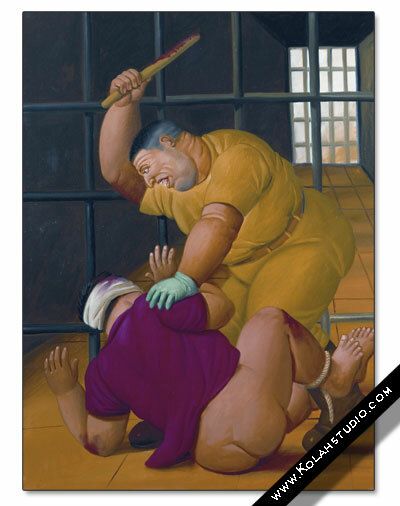 Botero, who has lived outside Colombia for decades, once made frequent, lengthy pilgrimages visits back, but the threat of kidnapping forced him to limit his trips. Still, he said that he had never lost sight of his homeland, always painting Colombian village scenery.